One of the most stressful parts about planning a vacation to Disney World is knowing how and when to make all those important Disney reservations. And when you add in the variety of different cancellation and deposit policies, it can be more than a bit confusing to try to figure out. Below we have compiled lists that will make all that easier. We cover everything from general resort and dining reservations all the way to cabana rentals, plus, we even tell you which Disney reservations you can expect to see in your My Disney Experience account. The 2 most common dates for reservations that people need to know are typically the days you can make your dining-related reservations (which is 180 days out) and when you can make your FastPass+ reservations (which is 60 days out for on site guests and 30 days out for guests staying off-site). If you aren't sure what those dates are for your vacation, our monthly Crowd Calendars calculate them for you. 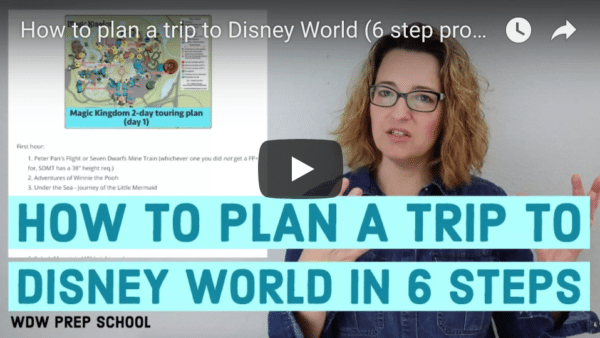 If looking at the charts below feels overwhelming, you should consider booking your vacation with a travel agent that specializes in Disney World vacation planning. A good travel agent will help you out with all your reservations so you don't have to stress plus they will also be able to provide personalized recommendations and suggestions for your trip. Get a no obligation quote from one of the agents at Perfect Story Travel now. These are the basics that you'll need when making your reservations. Nearly all of these can be booked using the same methods, but the payment terms and other details vary. Rainforest Cafe (2 locations) and T-Rex Cafe Up to 180 days ahead of time, beginning at 7 a.m. eastern time Some available online but calling can often be easier. Rainforest Cafe (Animal Kingdom location) - 407-938-9100, Rainforest Cafe (Disney Springs location) - 407-827-8500, T-Rex Cafe - 407-828-8739 If you book through Disney's system, you need to cancel by midnight the night before. If you book by calling, there aren't any cancellation fees. If you book through the Disney system, Disney rules apply that require a credit card to guarantee and a $10 fee if you don't show up. If you book by calling the restaurant directly, there's no credit card needed or cancellation fees. Yes, if booked through Disney's dining system. No, if booked directly with the restaurant. Although most Disney reservations just require a credit card to guarantee a reservation, these are the ones that require full payment when you book. Have other Disney reservations you're hoping to book or questions about any of the info above? Feel free to leave your thoughts in the comments. What about Pixar Play Place? I just read that Pixar Play Place at the Contemporary is closing and turning back into a game room. The code is showing up as text and throwing off your formatting on an Android tablet in Chrome. Hi, we are considering staying at a hotel in Disney Springs for our July 2019 trip. I recently saw that many of the hotels are now offering 60 day fast pass reservations, and magic morning privileges. Have you heard much about this, or have any more info? Thanks in advance! I see this post is a couple years old, but does BOG breakfast now only allow reservations 90 days before n advance? On my last trip in Feb 2016 I was able to book it at 180 +10 days. Also, the chart says the “+10” is not valid for Cind’s RT (180 days only). Is this still true or was that just something WDW tried in 2015? My travel agent has never heard this. Cinderella’s Royal Table (and all on-site dining) is 180+10 if you’re staying onsite. Be Our Guest breakfast is 180 days in advance, though many people have been having trouble getting it lately. Hi, loving all the information you’re giving us. We’re coming from England in August staying off site. Am I correct in thinking I can only book my fast passes 30 days before we travel, whatvtime in England do the bookings open on the mydisney app? And is it correct that I’m gonna have to go on every day to book the rides depending on what days I’m going where…? Yep! Anybody can make dining reservations up to 180 days in advance. I have seen it recommended to call the restaurant directly if all reservations online are booked. Do you know where could find those telephone numbers at which I could speak to a cast member? When I call the listed number on the site the representatives just repeat what is on the website. That only works w/restaurants that are not owned by Disney such as T-Rex Cafe, Rainforest Cafe, etc. Can I book my Fastpasses 60 days in advance if I’ve only put my deposit down on my stay? My reservation hasn’t shown up in MDE yet since I haven’t paid in full. You should have a confirmation number from when you applied the deposit. You will need to plug that # into MDE in order to link it up. Once you’ve done that, you will be able to book your FP+ at 60 days before your arrival date. We took our first trip in November of 2015, and just booked another for March of 2017. I specifically remember having to stay up until midnight to make our fast pass reservations, but now I see that the blog post shows 6 am eastern. Did this change or have I totally lost it? Thanks so much for all you do!! Love the site and seeing all the photos from your trips!! Yep, it just recently changed. Now all reservations open up in the morning (FastPass+ at 6 a.m. eastern, dining at 7 a.m. eastern). So weird. I was trying to book a preferred room at Coronado springs for sept 2017 and it says there are non available. Doesn’t make any sense to me. Can you book dining reservations if your Disney vacation isn’t fully paid for yet? We are traveling October 2016 and are making payments on our trip every two weeks and are worried we could miss out on making dining reservations since we still have a balance to pay on our vacation. Thanks for any help you can provide! Hi, my family and I are traveling to WDW the second week of December 2016. I’ve been reading your blog, which is great, and was wondering WHEN the best time to book is. I’m ready to book now (staying on-site) but am concerned that deals may come up between now and then. For instance, if a free dining package becomes available will I be able to be refunded and get it or am I just out of luck because I booked early? Thanks for your help! I know this was back in January but I saw this while looking for something else. You can always change your vacation package if a better deal comes along. I changed ours last year about 3 months before we left and saved about $700. When you look up your reservation online there is a spot you can click on that says change. When you click on that it will search for any new offers and you can get a price quote before you actually change anything. The only thing that can’t be changed online is travel dates and number of people going if I remember correctly but you can call and change them. Hi! We are going to WDW in October 2016 but staying offsite. I know I have to go online or call 180 days in advance to make dining reservations but how will they know my window has opened to make them if I don’t have a Disney resort reservation? Do I just need to link my ticket number? Does the ticket # have the dates? Is there a way to add a non Disney resort to my experience? Please help!!! You don’t need an onsite reservation in order to make dining reservations. The dining calendar opens 180 days in advance for everyone, not just resort guests. Hi, I want to reserve a spot for my motorhome and a cabin in June. What is your cancellation policy for Fort Wilderness? Quick questions; where online can you book dining reservations (haven’t played around on the Disney site too much) and where in WDW is the archery range? i love your site and now have some questions for you. i will be running marathon in WDW Florida in January. Which hotel/resort do you suggest us to stay in? I would like to be close to the place, where everything will be going on, but not spend entire fortune on it. I love your blog and posts! The only thing missing from the activities chart, is the safari trip that animal kingdom lodge provides to their guests. I wish you spoke about this, as we stayed in animal kingdom lodge last week and was disappointed to find out that the safari night trip is usually booked months in advance. I would have totally booked this when we originally booked the trip (7 months ago). Now I can plan it for my next trip! When paying the full price up front for CRY will your credit card be refunded when using dining credits? How does that work? Thanks so much. That’s explained in the “deposit required” column for Cinderella’s Royal Table. Thanks for the information! I really enjoy all of the tips and info you provide. Just a quick note….on the BOG Breakfast line I think it should say 90 days beforehand under the “How” column. Of course that is kinda up in the air at this point until they extend the test period. Thanks for the catch! Just updated that column. Thanks SO much for this post! We’ve just booked our holiday to WDW next Easter and trying to figure out when we can book dining and FP+ was making my head hurt! I would also add that you aren’t able to log in to My Disney Experience until 250 days before your trip (if it’s your first time using it – like me!). This affects ordering magic bands etc. Hello! Thanks so much for the helpful charts! One thing I noticed–cabanas, etc are not available at the Polynesian “for the foreseeable future.” If you want me to forward you the info I got from the itinerary planning folks, I’m happy to do so! Hi there, I have a question after reading your post. I thought you weren’t able to make resort reservations more than 180 days in advance. I would like to take my family in either late January or early February 2016 next year. We are a foster family, so we have extra kiddos and will need to book most likely a fort wilderness cabin. Since we are Florida residents, I’m hoping to take advantage of the Disney Florida ticket pricing in early 2016. So, here is my question. Can I make a reservation now for next February? If so, can I take advantage of the reduced rates in February when they are announced? Any advice you have would be appreciated! Thanks for you great website. I’m learning so much. I’m not Shannon, but I do know that you can reserve a “room only” reservation for 2016 right now. You can call Disney directly or use a Disney travel agent. You can add tickets to the reservation later. You can’t do it through the website and prices for the room may go up slightly upon announcement of 2016 packages. We are planning for the first half of 2016 as well so I just went through this. Hi…I want to reserve a cabin and motorhome spot for June. What is your cancellation policy? On the information about the Memory Maker, special event tickets and all dining, you can actually purchase/book it directly through your My Disney Experience. It is actually better to purchase it that way because it then directly links into your account. I book all of my client’s wishes right through their MDE. It’s much better to do it that way than to go to the Disney website. If I booked a 10 night stay, can’t I technically book 11 days, or is it only 10? So, can I book my first day (check-in) all the way through my checkout day – which is 180+10. 180 being checkin day, Plus the 10 days after that…? 10 is the max so if you need 11 days worth of reservations, you can make 10 days worth on the first day and then you’ll have to log on the next day to do the 11th day. Thoughts on adding trip insurance if we booked a vacation package directly with Disney? Assuming we would purchase through a third party and not Disney. Losing the 200 deposit is only a little more than what trip insurance would be so I am ok with risking that. The only thing I am hung up on is canceling 1 day or less ahead. We are driving, leaving on a Saturday and checking in on a Monday. So if something happened on our Sunday drive that would delay us would they let us adjust our dates and check in a day later or something? Thanks for all your help! Yes, you can book dining reservations without park tickets, but you’ll need park tickets connected to your account to make FastPass+ reservations ahead of time. Love the chart and your podcasts! I may be missing something about the room only and 499 days, how much would the deposit be if the rates are not release at that time? We are planning a trip Sept 2016 and 499 days would be this weekend. Would we be charged the current rate and charged the difference later or is it like the package where we would need to wait until the rate are released? Thank you for all the great advice you provide! Yes, you’ll be charged the current rate and then your balance will be adjusted later to reflect the new prices. Thank you for taking time to reply. Thats what makes your site and facebook page unique, you take the time to answer questions. I have found this is not true with many sites.